Cheers everyone, time to clear your minds for a new IPA. Our Beer of the Week is Mind Haze, a new IPA from Firestone Walker Brewing Company. It's juicy, yet balanced; hazy yet clean and full of hop flavor. 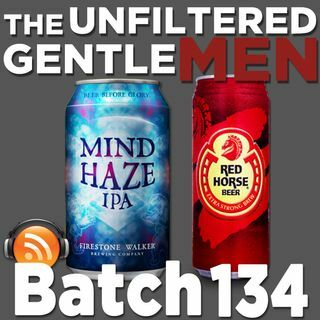 Greg talks about his beer research at a Firestone Tap Takeover, and the gentlemen discuss their different Super Bowl viewing parties and takes on the commercials. Listener Pablo writes in to share his experience in response to the woman getting drunk at Walmart. In Sports News: a ... See More 10-year-old proves Tom Brady is a cheater, a man wins big on the Rams losing, the ratings for Super Bowl 53, the Lakers are trying to grab Anthony Davis, and NASCAR is punishing cheaters. Warming up in the bullpen is Red Horse Beer from San Miguel Brewery in the Philippines. In Booze News: the government is rushing to approve alcohol labels, Bud Light encouraged the Rams to lose, the midwest is so cold that beer can't be delivered, Sierra Nevada makes their first brewery acquisition, the amount of money Bud Light spent on Super Bowl commercials, and more. Our Beer Babe of the Week is Claudia, make sure and follow her on Instagram @brewgirl661! Old Timey Word of the Week: "Jackanapes .” Use it in a sentence on social medias for a shout out! Don't forget to check us out at www.theunfilteredgentlemen.com and to follow us on our social medias for some great beer shots: www.facebook.com/theunfilteredgentlemen, @unfilteredgents on twitter and TheUnfilteredGentlemen on Instagram! We want you to drunk dial (805) 538-BEER (2337), we'd love to hear from you!